Mmm...my "magic" sake-kasu (sake lees). 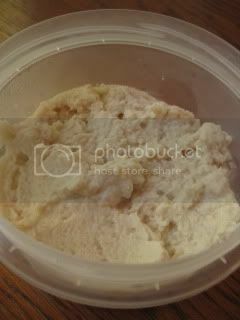 Yes, it's a by-product from making makkoli (rice wine). 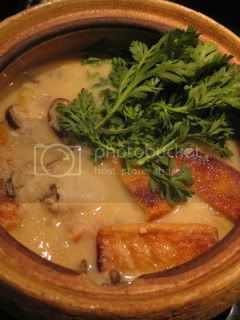 It was a chilly night, so I made healthy & hearty soup with my sake-kasu. 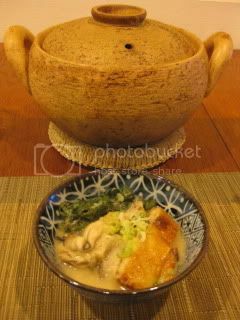 For this dish, I used my soup & stew donabe, "Miso-shiru Nabe". 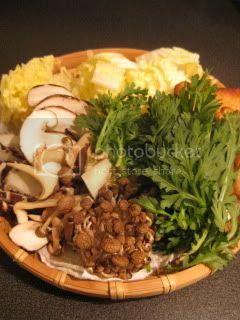 Get the base ingredients ready...napa cabbage, toasted abura-age, shungiku (chrysanthemum leaves), and sun-dried mushrooms. 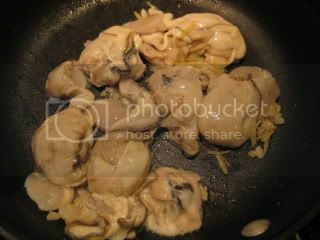 Clean fresh oysters (about 10 oz) and quickly pan-fry them with some ginger and garlic in sesame oil until just barely cooked through, and deglazed with 3T sake and 1/2T soy sauce. Separate the oysters from juice. Set them aside. 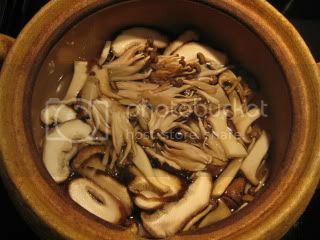 Combine 3C water, 1 2"x4" dashi kombu, and mushrooms in Miso-shiru Nabe. Bring to simmer slowly over medium-low heat. Add napa cabbage. Cook for 4-5 minutes. Remove kombu. 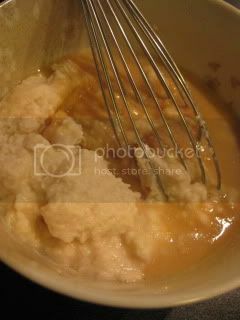 Whisk together 1/4C sake-kasu and 2T saikyo miso. Add to the soup and whisk until the mixture is dissolved. Add the juice from cooking oysters. Add the toasted abura-age, oysters, and shungiku. Turn off the heat and let it sit for a few minutes. (With high heat-retention ability, the soup will continue to simmer for the next minutes after turning off the heat.) Serve at the table.